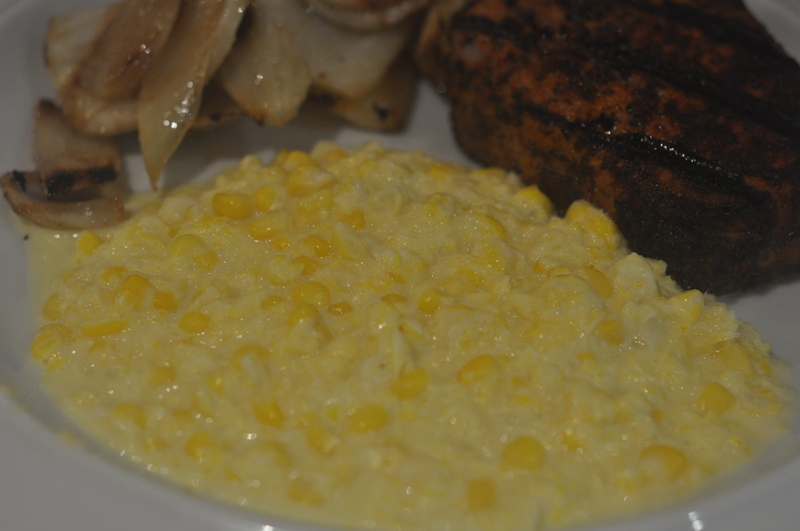 I’m not sure why I was inspired to cook creamed corn. Perhaps it reminded me of a beloved dinner of my childhood: Stouffer’s Corn Souffle. Perhaps it was the photographs on the Design Sponge site. Perhaps it was the fact that while I love the taste of fresh sweet corn, I don’t like thinking about tooth floss while I’m at the dinner table. In any case, I made it. And then I made it again. And again. In short, The Professor loved it. It was sweet and satisfying. It was just creamy enough. Every bite delivered a few nice pops of flavor, because some of the kernels are added towards the end of cooking, after you’ve pureed the mixture. 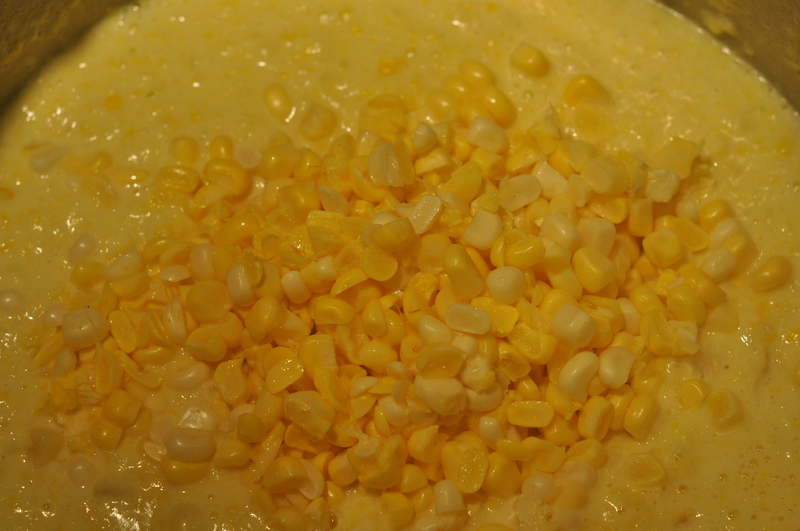 I made the dish once during the winter using frozen corn. Don’t bother. Wait for the arrival of summer’s fresh corn. 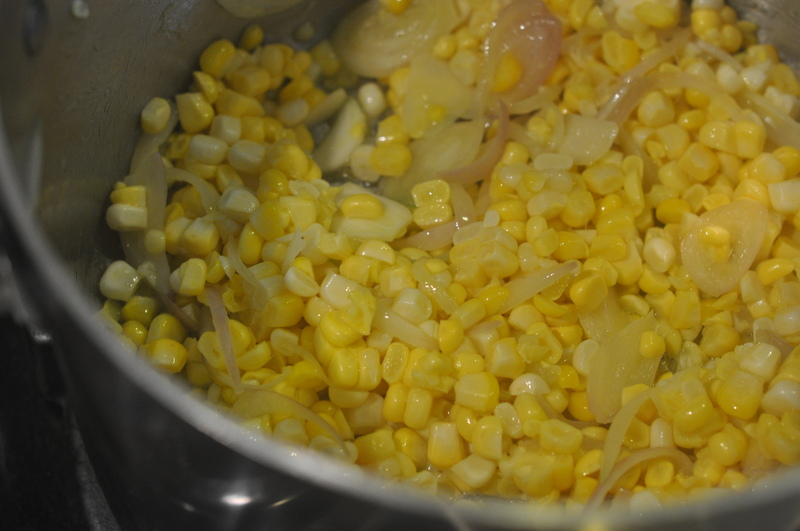 It’s still a bit early in the season, but yesterday I bought a few ears and cooked up a small pot of creamed corn. It was as good as I remembered. It works well served with grilled fish. (Last night I served it with grilled tuna.) But sometime in the coming weeks I plan to serve it alongside these stuffed poblano peppers for a vegetarian meal. You can see Harold Dieterle’s recipe here. A few notes: I use whole milk instead of cream, and my cherished immersion blender instead of a regular blender. 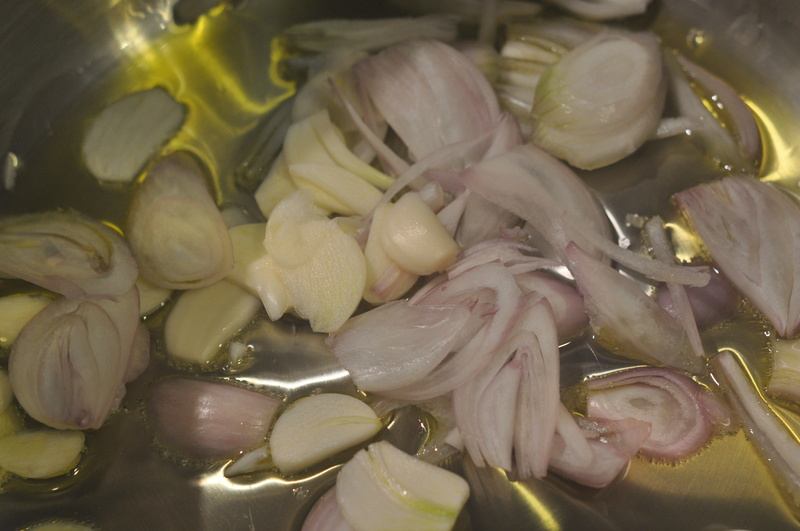 Setting aside the flavor, The Cook appreciates the recipe’s limited number of ingredients (shallots, garlic, corn, olive oil, milk) and how quickly they come together. You don’t even have to finely mince the garlic and shallots — just slicing will do. The hardest part, if you haven’t done it before, is cutting the corn off of the cob. You’ll find the kernels tend to go flying. To minimize the mess, I hold the corn at an angle, slicing the kernels off of the side facing the work surface and rotating the ear until I’ve run my knife over each part. That way most of the kernels fly right into the cutting board. › Newer Post My First Siena Farms CSA Box Is Here! I really enjoy your posts. In this one the professor’s wise restraint in commenting on canned creamed corn is amusing, and your photos are always beautiful. The recipe reminded me of my curried corn soup from the early 1970’s, one of those recipes which make you wonder, “Can that really be as good as I used to think it was?” My friend Jayn Seigel had said, “It’s so easy and so good: just process together the canned creamed corn, the half and half, and the curry powder, chill it, and serve it in a mug garnished with a sprig of basil on a hot summer night.” It did indeed become a favorite. You could wing it for amounts; one caveat however: I suspect it’s best to use a very ordinary curry powder such as McCormicks. Recently I ruined another old favorite – curried lentil soup – by using the curry mixture from my current source of spices, the bulk spice dispenser at WholeFoods. The WholeFoods version was somehow too particular, with each curry ingredient’s taste separately insistent, rather than the familiar, somewhat more bland McCormick’s blend which smoothes right into the other tastes. Mmmm …, especially good with corn.